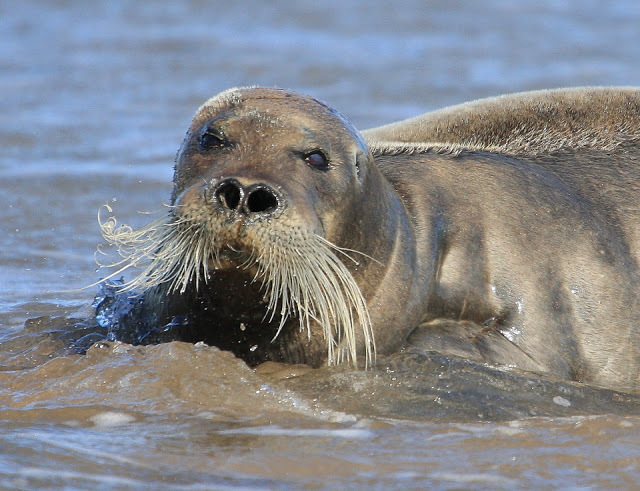 Since it seems to be the in thing at the moment with all the men having beards I thought it would be prefect timing to show you a young bull seal with his perfect whiskers. Okay it is not a bearded seal but he is proud of his young whiskers and with him being so dark in colour they stand out like a sore thumb. Yes its not like the Bearded Seal we saw in 2011 at Low Newton, which was really rare but for a normal Atlantic Grey Seal I was very impressed with the whiskers and he looked proud of them too. Yes, I know they both look a bit funny but there is no need to laugh about it. Thank you for taking time to read this blog and I do hope you enjoyed it. Once again thank you and until next time.